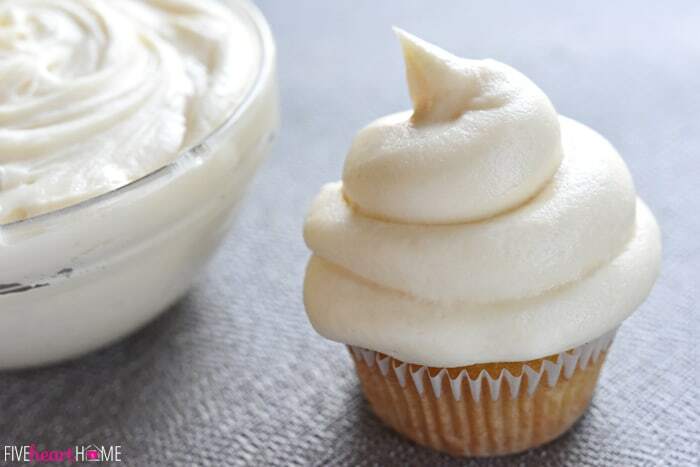 Sweet and slightly tangy, this quick and easy Cream Cheese Frosting comes together with just FOUR ingredients and complements a variety of cakes & cupcakes! Happy Friday, friends! I’m coming at you today with a simple, staple recipe that I make at least once a month. 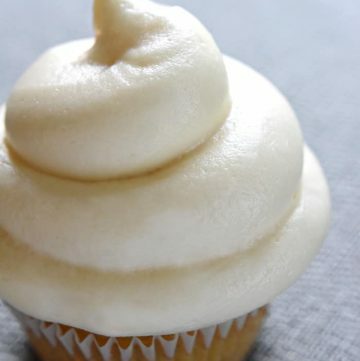 Classic Cream Cheese Frosting is, hands down, my favorite frosting EV-AH. More specifically, it’s my favorite cupcake frosting recipe, as the perfect complement to these famous vanilla sheet cake cupcakes. It’s also delicious on carrot cake and Italian Cream Cake and red velvet cake. It’s amazing on chocolate cake and lemon cake and pumpkin cake. Really, it’s just flat-out fabulous. 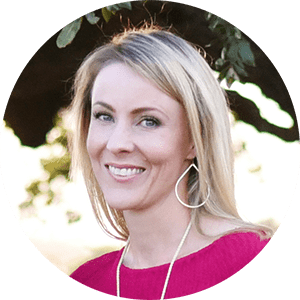 And even though I already shared it on the blog not long after I first started blogging (way back in ’13), I posted it then as part of that aforementioned vanilla cupcake recipe, which means it kind of gets buried on the site. 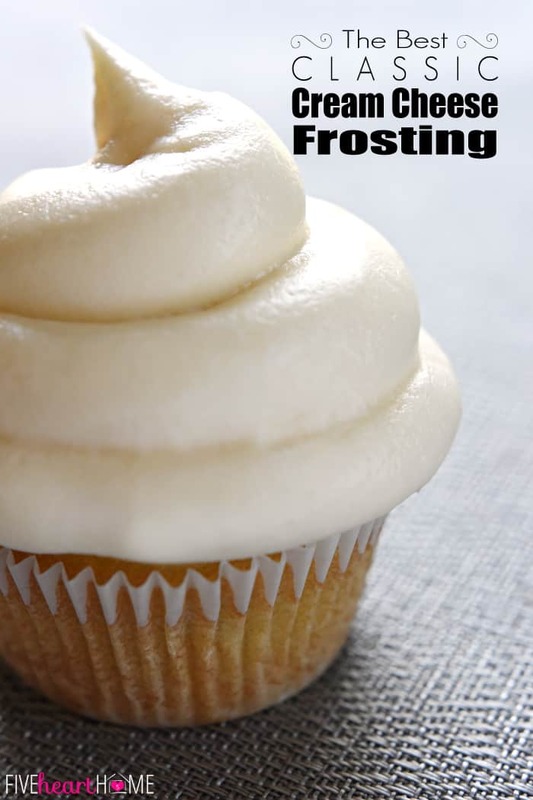 But by golly…this easy Cream Cheese Frosting needs to stand alone so that people searching for a great frosting recipe have a chance to find it! I realize this isn’t rocket science, folks. It’s a really simple recipe with minimal ingredients. It’s done in a matter of minutes. But as a cream cheese frosting connoisseur, these are the proportions that I’ve found to render the yummiest results. That being said, feel free to tweak the sweetness if you like by increasing or decreasing the powdered sugar. I actually prefer that my cream cheese frosting is not overly sweet, because I like the slight tang from the cream cheese to come through. In fact, I think that’s why I adore this frosting so much. I’m not a fan of cloyingly sweet frostings, and this isn’t one of ’em. In my humble opinion, the key to taking this frosting from good to great lies in the vanilla you use. For the love of all that is good and holy, use pure vanilla extract! No imitation stuff here, please. And to take it up a notch more, invest in high quality pure vanilla extract. I’m telling you…it might cost a bit more, but it will make all the difference in your baked goods. I made this particular batch of frosting last week to put on cupcakes for my 7-year-old’s school Valentine’s party, and when I did, I shared my quick and easy cupcake frosting method with my Instagram followers (I hope you’re one of them, because it’s my favorite social media for sharing…and over-sharing?). Rather than slopping on your frosting with a knife, you just need a gallon-sized freezer bag and about five minutes…hop over to read the details if you don’t already know this trick! 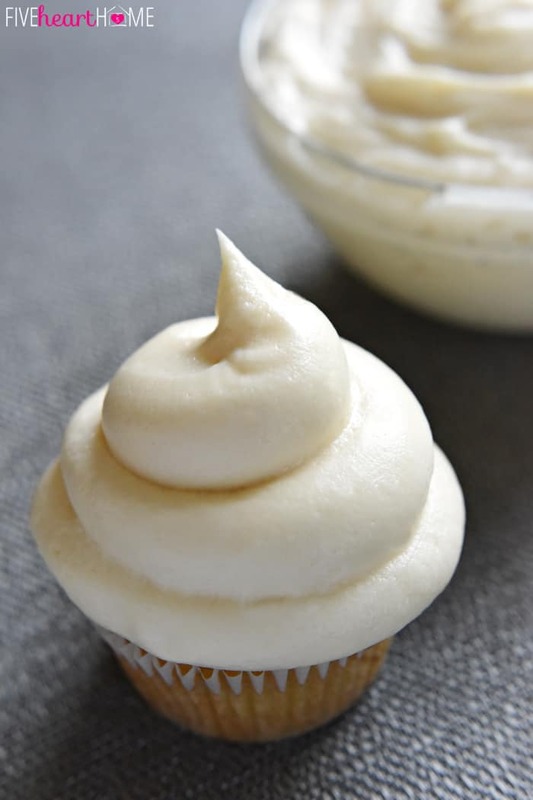 Speaking of cupcakes, one batch of this recipe should make enough frosting to ice 24 cupcakes with a knife…and this means spreading each cupcake with a reasonable amount of frosting. 😉 But if you really want to pile on the frosting (such as by using the bag trick mentioned in the previous paragraph) for cupcakes with sky-high frosting like those pictured in this post, you will probably need to make 1.5 or even 2 times the recipe to cover 24 cupcakes. Butter can range from pale to dark yellow, so obviously, use the lightest shade of butter that you can find. While I don’t really recommend using anything but pure vanilla extract, you can use a clear imitation vanilla extract for an even lighter shade of frosting if that’s most important to you. Also, the longer you whip your frosting, the lighter and fluffier it will become and the lighter in color it will appear. Adding a teeeensy drop of violet food coloring can also help yellow-ish frosting appear more white. Fully incorporate a very small dot or drop before determining if you need to add more. Be careful not to add too much or your frosting will turn gray or purple! Vanilla prices have skyrocketed over the past couple of years because of a worldwide vanilla bean shortage. I used to buy my beloved Nielsen-Massey by the 32-ounce jug on Amazon…but the current price for a mass quantity like that is rather heart stopping. So these days, I buy a smaller bottle of “the good stuff” and only use it in my favorite recipes (like this one!) where the vanilla flavor truly shines through. This frosting recipe holds up best when chilled. It is pretty soft at room temperature, meaning it’s not the best choice for frosting an elaborate cake that needs strength and structure. I usually frost my cake or cupcakes ahead of time, refrigerate, and then let them come to room temperature for about 30 minutes before serving. 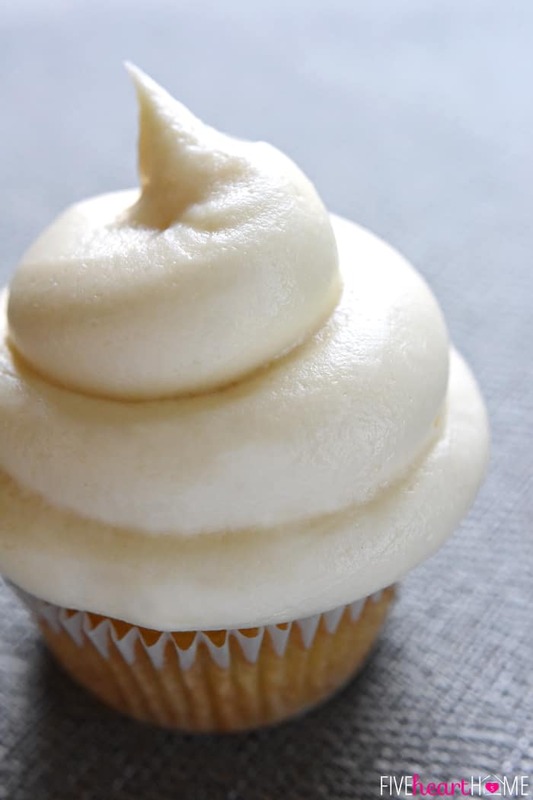 You can watch just how quick and easy it is to make this frosting below! 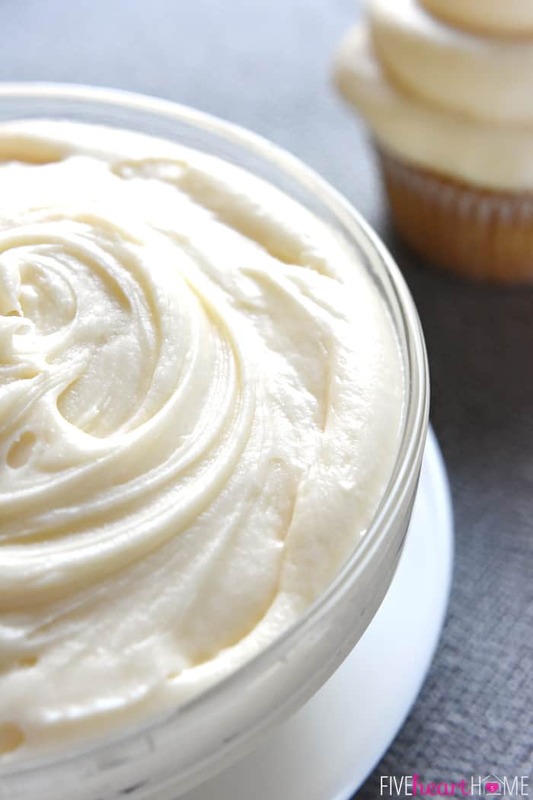 Sweet and slightly tangy, this quick and easy Classic Cream Cheese Frosting comes together with four ingredients and complements a variety of cakes & cupcakes! Using an electric mixer, beat together the butter and the cream cheese. Slowly blend in the powdered sugar and vanilla, then beat on high until well-combined, smooth, and creamy. The longer you whip this frosting, the lighter and fluffier it will become. Post originally published on February 19, 2015. I am so happy to see some people are using salted butter. In recipe likes this the little bit of salty flavor makes the icing taste even sweeter in my opinion. My motto is “any cake is a good conductor for cream cheese icing”! I agree with you, Linda! I’ve made this frosting many times with unsalted butter, but I think that the tiny bit of salt from salted butter lends an extra depth of flavor. And you are so right…I can’t think of a cake that wouldn’t be good with cream cheese frosting! Thanks for stopping by and hope you have a wonderful week ahead! Your frosting recipe was amzing on my butter pecan ?. Oooo…I haven’t tried that combo before, Agnes. Sounds delicious…thanks so much for the suggestion! 🙂 Hope you have a great week! OH.MY.STARS! I.WANT.SOME! I’m not real fond of cake, but I’m all about the frosting…especially if it has cream cheese. Lovely recipe…love the way you frosted them too. Pinning! Thanks so much for sharing with us at Weekend Potluck! I have to admit that I do love cake, Marsha…but if we’re talking about cream cheese frosting, all I require is a spoon! 😉 Thanks so much for hosting your fun party and for stopping by…hope you’ve been having a fabulous weekend! This has become my staple buttercream but Inam looking for a chocolate buttercream, any suggestions? I don’t need the cupcake; I’ll just have the frosting, please! YUM! Thanks for linking up with Best of the Weekend! Pinning this! Ha, Amy…me too! 😉 Thanks so much for hosting BOTW, for hopping over, and for pinning. Hope you’re having a nice weekend! Yum! I love cream cheese frosting. Stopping by from the Lou Lou Girls Fabulous Party. Pinning for later. Ha, Tracy…your comment was awesome! Made my night. 😉 I’m SO happy that this frosting was SUCH a hit! And I hope that it provided the extra energy boost/sugar rush that you needed after getting less than five hours of sleep before you had to be at work — ha. 😉 Thanks for taking the time to enthusiastically share that you enjoyed this recipe, and I hope that you’re having a great week! My cream cheese frost always comes out tasting amazing but soft and runny. How do you make it more solid? More powdered sugar? My husband wanted browning today with frosting. So I tried your Classic Cream Cheese Frosting. I only made 1/2 the recipe and whipped it a good while. It came out wonderful. In fact I had to chase after my husband to get the bowl of frosting back, so there would be enough to frost his brownies with. I think it is safe to say….he loves it! Thanks for sharing! Ha ha, Te-Ann…having to chase down your husband and the bowl of frosting is a good sign that he liked it! Hope there was enough left for the brownies. 😉 And I think I’m going to have to make some of this frosting for my next batch of brownies…what a great idea! Hi Kimberly! I apologize for my delayed reply…I’ve been out of the country. You can make this frosting several days or even up to a week ahead of time. If you refrigerate the whole bowl of frosting in order to use it later, you’ll need to let it soften to room temperature and stir it well before spreading it on anything. If you frost your cake/cupcakes immediately, they’ll need to be stored in the refrigerator until shortly before serving (but I only recommend making cake/cupcakes a day or two ahead of time or it/they may start to dry out). Hope that helps! Made this 9/25/15 for cupcakes. Used 4 cups powdered sugar, unsalted butter, plus about a teaspoon of salt. Very good!! Had enough left over to frost an 8 x 8 cake (we don’t pile the frosting on too high for cupcakes). Everyone loved the frosting and the baked items I made. 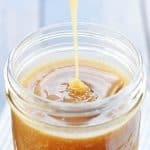 Will an electric hand mixer work for this recipe? I can’t wait to try it. An electric hand mixer should work just fine, Kris…it just might get a little messy, so use a big bowl! 😉 Enjoy! 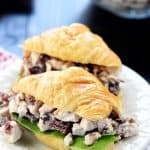 I typically don’t review recipes, but this one is fantastic. I was franticly looking online for a cream cheese frosting recipe, to frost cupcakes for a birthday party tomorrow and ran across this one. I love it! It turned out perfect, Thank you! So happy to hear it, Michelle! I could pretty much eat this frosting with a spoon…and maybe I do occasionally. 😉 Hope it was a hit at the birthday party! Can I get an approximate time to whip this if I want pretty fluffy frosting? 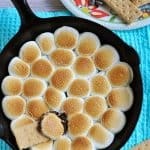 So excited to try this with your Vanilla Sheet Cupcakes! Samantha could you please advise me.. I am making a huge carrot cake and want to frost it with your recipe. Will this frosting hold up to being applied the day before the wedding and being transported a few miles to the venue Please could you advise me. Many thanks. Hi Maria! Gosh, I’m really nervous giving advice about a wedding cake! I’ll tell you what I know about this frosting after making it a bazillion times, though. This frosting firms up when chilled but it gets pretty soft at room temperature, particularly if the room is warm. I often frost cupcakes or cakes the day before serving them without a problem, though. So I would say that you could definitely apply this frosting to your carrot cake the day before the wedding as long as it was going to be refrigerated afterwards. If your cake is very stable, it should be okay for the few miles during transport. If it could be refrigerated again until the wedding starts, that would be ideal…not because the frosting will go bad, but because if your cake is large and heavy with stacked layers, I’m afraid the layers could start to slide a bit over time if the frosting is at room temperature? If you have dowels or supports in your cake, however, that may not be a problem. So I don’t know if any of this helps you! Honestly, if you have time, I would make a batch of cupcakes or something ahead of time and use this frosting as a test run to see how it behaves for you and if you think it would be suitable for your wedding carrot cake. 🙂 Good luck! Why is my frosting yellow?! Help! okay, nevermind. its white now, but i have tiny chunks from the powdered sugar. how do i get them out? I love that you can add as much or as little confectioners sugar to adjust to your own level of desired sweetness and the consistency is still perfect. I used 2.5 cups of confectioners sugar and it was the perfect balance for layers between a chocolate cake with chocolate buttercream frosting. Delicious! I will keep this recipe on-hand – thank you!!! This recipe was a little sweet for my taste: to me, the sweetness overpowered the tang of the cream cheese, and I only added 3 cups of sugar. I also only added one teaspoon of vanilla and thought it was plenty (although I don’t like a strong vanilla flavor.) My fiancé couldn’t get enough of it, though, and nobody at church complained! 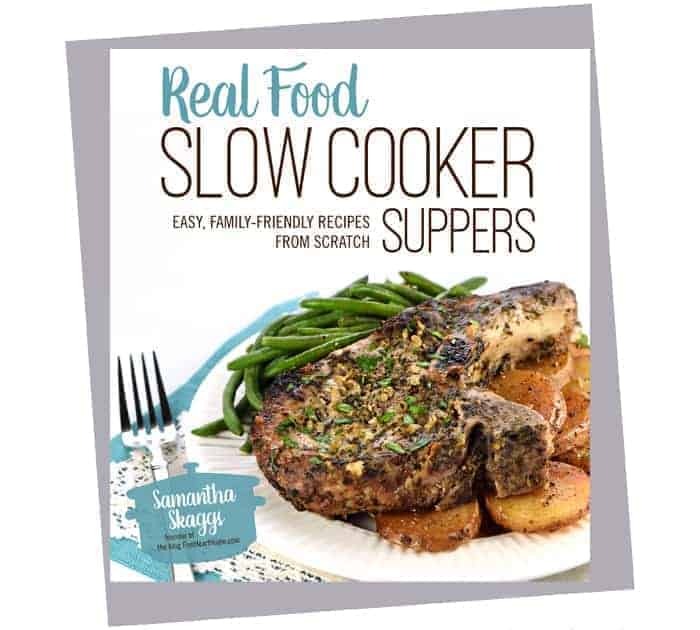 Also, when I was researching other recipes, a lot of people complained that those recipes were too runny–this one was not at all. I put it in the fridge while I made another type of frosting, and when it came out I could barely pipe it! It’s definitely a great frosting for piping! I really need your advice on one thing, I have read this a lot of times that the more sugar you add, more runny the frosting become, so in order to make a stiff frosting which can be used to make frills you need to add less sugar, Is that true? I really need your help on this. Thank you so much for this recipe. It surly took my Strawberry Cake up a notch. I added a few table spoons of cool whip to it and it became even lighter. I also added a few drops of vanilla flavoring. My husband and son loved it. I will deffinately try this with my carrot cake.Thanks again! I used this recipe for theee different cakes that I made over the Christmas holiday….Abosulety the best recipe for cream cheese frosting I have ever made! OH OH MY GOODNESS! 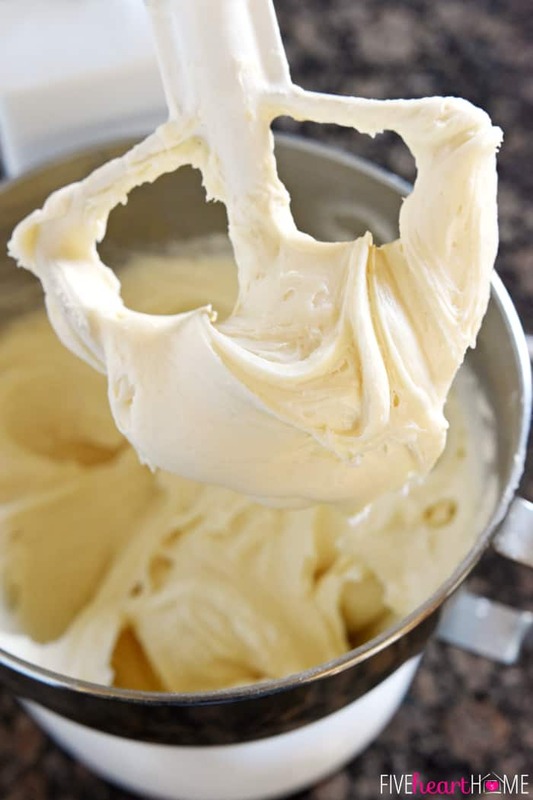 I literally just made this icing for my daughters birthday cake for tomorrow and it is the absolute best cream cheese icing that I have ever had! It’s slightly tangy, and not overly sweet just like you said!!! I don’t like my icing overly sweet either, ugh! Just simply amazing and perfect! I’m in love with your recipe! She says thank you! 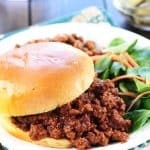 ?I am going to share your recipe with everyone! How I wish I could bake goodies and take them to my child’s school. But it’s forbidden in my state. I am jealous. Lucky you for having that. Just perfect and so easy to make . This is definitely going to be in my recipe book. Thank you !! Wow! It works!! I have never made a successful cream cheese frosting until now! Thank you for sharing!! I love this recipe it was so delicious and fluffy. I think I would recommend this recipe to my friends. Hi, Meagan! It’s hard to spot sometimes, but the yield is at the top left corner of the recipe. 🙂 This recipe should frost about 24 cupcakes…but if you’re really generous with your frosting, it may only cover 18 cupcakes. Hope that helps! Hi Elaine! I have used this frosting on layer cakes, but it does need to be refrigerated. At room temperature, it gets pretty soft. For a 2-layer round cake, I would double the recipe to give you plenty of coverage. Hope that helps! I was wondering how this would hold up to being piped? I am trying to make a unicorn cake. And was worried about the mane sliding down the cake. Great question, Tori! I don’t think this frosting is stiff enough to be piped. While it’s firm when chilled, it is soft at room temperature and I could definitely see the mane sliding down the cake. Good luck with your unicorn cake! Delicious! Found this on Pinterest today, looking for a frosting for my strawberry layer cake. So smooth and lightly sweet. Will be putting fresh strawberries on top before serving. Thank you so much.? How do you get this frosting as white as on the photo? Butter is yellow and the vanilla essence makes it even more yellowish. Hi Heike! This frosting definitely turns out off-white. That being said, some brands of butter are pretty pale (almost white) and some are dark yellow. So that can make a difference. And while I much prefer the flavor of pure vanilla extract, you can always use clear imitation vanilla instead if you’re trying to keep your frosting as white as possible. Hope that helps! If it’s slightly yellow I would recommend getting a toothpick and dip a tiny bit of purple food coloring or blue (if you dont have purple), then mix. When I say tiny bit, I mean a very tiny spec until it becomes white. I just used this cream cheese frosting recipe for a red velvet cake and it is perfection!!! 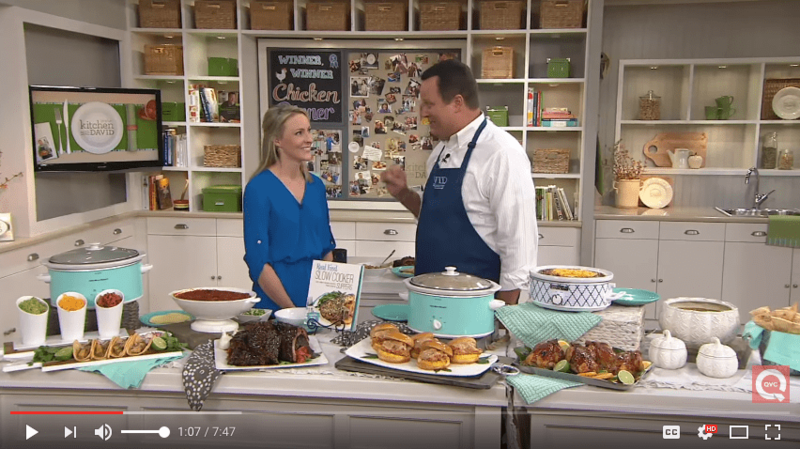 I will never use another recipe, definitely a keeper….PINNED!! I made this frosting to go on my Triple Chocolate Kahlua cake. The sweetness of the frosting complimented the Kahlua flavor in the cake very well. This icing is so stellar! I first found the recipe on Pinterest, and then I decided to try it on my pumpkin cake that I made! What an amazing combination! My whole family loved it! Thank you so much! Help! My frosting was runny. My husband got whipped cream cheese.could that be the problem? I used 4c powder sugar. The perfect topping for so many things! I could literally eat it off a spoon – it’s SO good! I am all in when it comes to cream cheese frosting! Your frosting is so fluffy and smooth! A must make for me! This is such a delicious classic frosting that my family will love always! Turned out perfectly! I was pleasantly surprised. This is only the second time I’ve made icing. Thank you for the recipe!